Ukulele players drove through Friday night's wicked weather to bring a little piece of Hawaii to Edmonton. 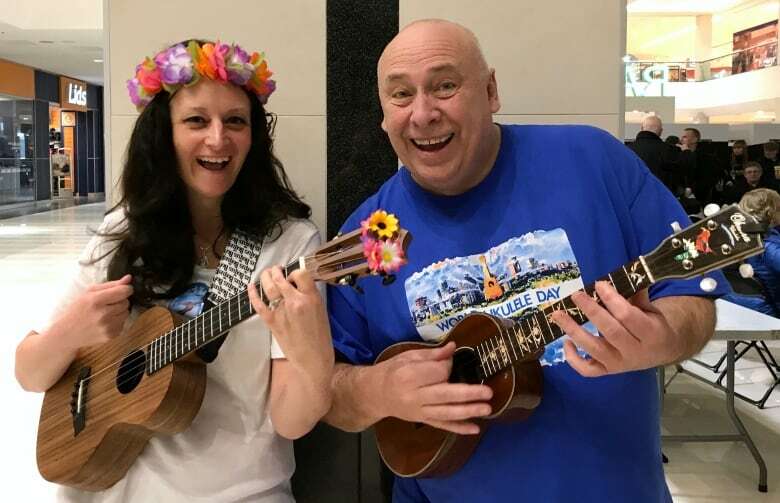 Fans of the four-stringed instrument came together at West Edmonton Mall to celebrate the third annual World Ukulele Day. Ukulele players drove through Friday night's wicked weather to bring a little piece of Hawaii to Edmonton. 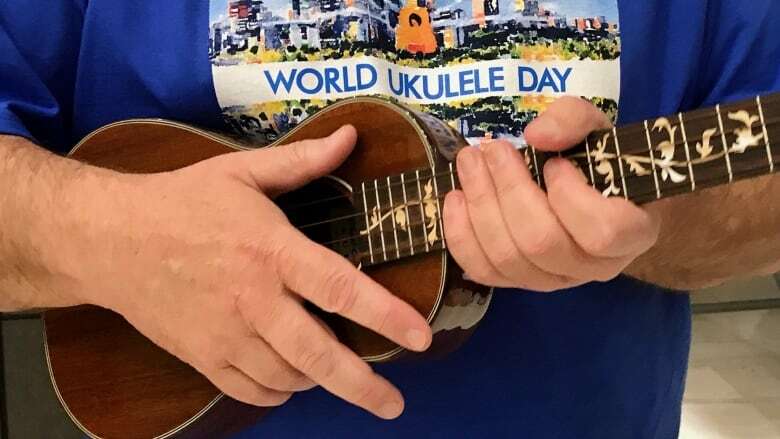 Fans of the four-stringed instrument came together at West Edmonton Mall to celebrate the third annual World Ukulele Day. 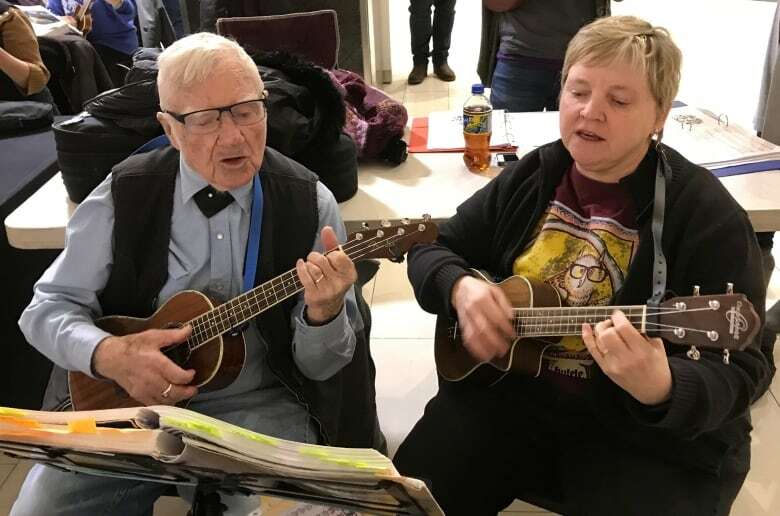 They strummed their strings and sang along to some classics, like The Beatles' "Octopuses's Garden" and "Feelin' Groovy" by Simon and Garfunkel. Ukulele enthusiast Ron Mercer has attended the event every year. He said it's hard to feel down with a ukulele in hand. "It makes you happy," he said. "There's no sad ukulele songs." People of all ages and abilities played the instruments at the giant jam session. "It's fun. It's easy. It's a four-string thing," Mercer said. "It's an entry level instrument to learn other instruments." There's a small community of ukulele players in the Edmonton area. Mercer said he encourages people to join that community so they can meet new people and enjoy the music. "And you look good holding a ukulele," he said with a laugh. Gibbons elementary school music teacher Tanya Frigault brought some of her students to the event. She said taking part in the strum-along was empowering for the young musicians. "A lot of kids in school, they're so worried about making all the right notes, making the music sound perfect," she said. "But when you're in a jam situation like this, they can just play and hear how beautiful it sounds." Frigault said learning to make beautiful music with a ukulele is easy, but mastering the instrument is tough. Friday's performance gave students a chance to interact with both master and amateur ukulele players. "It's really nice to get together with other ukulele players, because it's a really great bunch of people," Frigault said. "They're fun, friendly, it's a safe environment."